Citizens of Hama province have directed their wrath towards the militants who destroyed bridges connecting opposition and government areas in Hama province earlier this day. President of the local council of Qabr Fidda village Abdelmuain al Masri comdemned the act of destruction and surprisingly declared that this development serves the interests of the Syrian government. In turn, local councils of Al Karim, Al Ahrafiya, Ramleh, Tamaana al Ghab, Al Darabala, Al Hakoura, Al Touta and Jisr Touta issued a joint statement expressing concern over the fate of the villages after the destruction of the bridges. The bridges of Al Sharia and Beit al Ras in Sahl al Ghab area in Western Hama have been demolished by Jaysh al Izzah militants earlier on Friday in an attempt to hinder the upcoming offensive of the Syrian Arab Army. 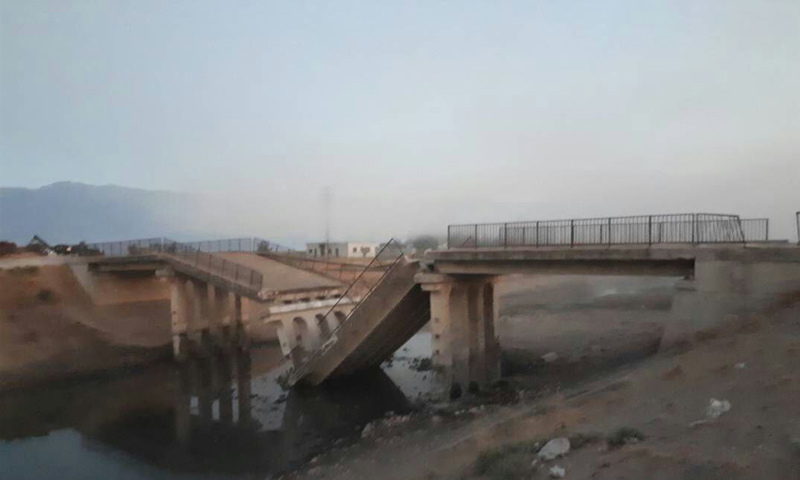 The militants also tried to destroy Al Hweiz bridge, but faced the resistance of the locals who prevented them from carrying out their intentions.